Coevolution drives biological diversification, structures ecological communities, and promotes major evolutionary transitions such as the evolution of sexual reproduction. 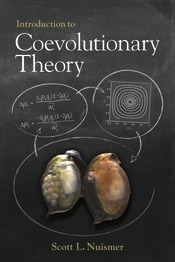 Introduction to Coevolutionary Theory develops the mathematical models and key theoretical results upon which our current understanding of coevolution rests. By anchoring each chapter in the biology of a well-studied species interaction and providing a step by step guide to model development, analysis, and interpretation, Nuismer takes the mystery out of mathematical modeling and provides readers with the tools they need to develop and analyze coevolutionary models of their own.